My sister, Andrea, is 18 months older than me. As you might expect, we fought like wildcats when we were young. And we were also best friends. Although Chris’ military career took me far from my childhood home, Andrea and I have always stayed close, talking on the phone daily and making efforts to get our families together as often as possible. She’s truly my best friend, biggest supporter and most loyal confidante. In April 1999, everything changed. Our family traveled from Delaware down to Atlanta to have Victoria and Zach baptized in my childhood church. Andrea and her husband, Bob, were godparents and everyone in the family was excited to share in such a special day. But that day would be the last day we all knew such carefree happiness. Andrea’s infant son, Cam, was 6 months old and had had escalating health issues: recurrent ear infections, reflux, strabismus, increasing discomfort and frightening choking spells. Despite all of the doctor’s dismissals and placations, Andrea knew something was wrong. Immediately following our children’s baptisms, she took Cam to Scottish Rite Children’s Hospital. He was admitted immediately and he never left. Cam was born in September 14, 1998 and passed away on April 25, 1999. He died due to a rare genetic disease called Gaucher’s Type II. It is a degenerative, neurological condition that is always fatal. Cam was 7 1/2 months old when he died in his mother’s arms. After Cam died, no one knew what to do, most of all Andrea. There was nothing to do, he was gone and no one could change that. We all had our lives to keep us busy, to try to take our minds off of the devastation. But she and Bob were left with a hole that nothing or no one could fill. That’s when I decided that no matter what, I was going to call her, every day. Sometimes we’d just sit on the phone, sometimes she’d cry. Sometimes we’d cry together. It was an agonizing time in our lives, made so much harder by the fact that there was no cure, no relief. And watching someone you love so much while the center of their life falls away is truly heartbreaking. Losing a peer is difficult, losing a parent is painful, but losing a child is unfathomable. In July 2005 Chris and I decided to adopt from China. I remember telling Andrea about our adoption plans and I could hear the excitement in her voice. It was as if a dream of hers, long suppressed, had been rediscovered. After much discussion with her husband, who was adopted himself, they decided to pursue the foster program, they hoped to be able to adopt a young boy through the foster/adopt program. They completed their homestudy, a series of classes and fulfilled all the requirements of the state. Then they waited. In the meantime we came home with Isabelle and had even started paperchasing for Sophie. In the winter of 2005 I read an email from the Heritage yahoo group… a new SN list was out. Of course, I checked it out and saw the most precious face staring back at me. 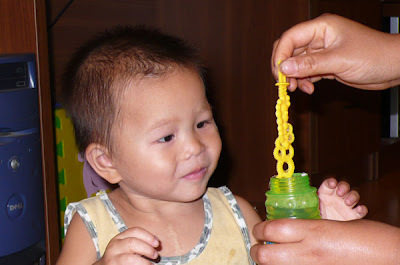 His name was XiaoYu, he was 2 years old and his SN was VSD. I forwarded just his picture to my sister, knowing she was committed to domestic adoption, but also knowing she would appreciate such a handsome face. That email set into motion a chain of events that lead Andrea and Bob to China to bring home their son, Dane XiaoYu, in August 2006. At last, there was a sparkle in my sister’s eyes again, a purpose in her step. She wasn’t just enduring her life, she was enjoying her life again. She and Dane immediately fell into a mother- son relationship that brought tears to my eyes. Clearly, God had intended this child to by her son, and she his mother. Over the next year she would mention to me how much she would love to adopt another boy… we both knew too well how many boys wait and wait for a family. We’d discuss often all the sweet faces we’d see on waiting child lists… faces of precious boys who needed and deserved the love of a family. The only thing standing between Andrea and Bob and another son was money. They’d been very blessed by family and friends reaching out and helping support Dane’s adoption in big ways. And even through the loss of a job and squeezing every cent out of their savings, God managed to bring Dane home. Andrea would share with me the child of her heart, IF she were to ever be able to adopt again: he’d be a heart baby, since Dane had a heart defect and it was a SN she was most comfortable with. He’d definitely be a he… as much as Andrea loved my girls, she knew in her heart she wanted another boy. And he’d be born in early 2006. A family friend had given her a very special Christmas ornament for each of her children’s birth years and she cherished each and every one. When she received an ornament dated 2003, she wondered what this would represent and sure enough, Dane was born in 2003, making this ornament especially sweet. Last year she received an ornament dated 2006. She wondered if God was up to something. She also knew she’d love to adopt a child from a well run orphanage… Dane had been at an orphanage that supplied waiting parents with additional information, there were some Americans who volunteered there full time… I told her she’d never be so fortunate again. Famous last words. I know Kathy because of Isabelle. In fact, Kathy and I became friends when her family decided not to pursue Isabelle’s file. When I contacted her to ask her ‘why’ we began emailing and we became fast friends. Over the last 3 years we’ve stayed in touch, encouraged each other and prayed for each other. 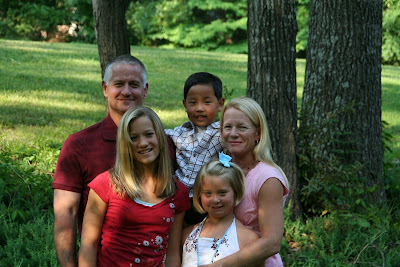 In November 2007, Kathy emailed me with wonderful news, she was going to be bringing home another child from China! In her email she included a note about ‘Jesse’ from New Day Foster Home… did I know anyone who might be interested in adopting him? My heart began to race… how did I know ‘Jesse’? Suddenly it clicked: this was the boy I sponsored through New Day. I raced to the phone, my heart pounding in my chest… I couldn’t even remember my sister’s phone number and I call her every DAY! When I finally got her on the phone I had to wait for her to finish with the painter… such mundacity! As soon as she got on and I opened my mouth, I think she understood the weight of my words. “I think I have just found your son!” I exclaimed. As I told her about him, I forwarded all the email updates and photos I had received of him over the months. He was so precious! In all honesty, I had chosen to sponsor him just ‘cuz he was so darn cute! And I could not believe that God had brought this child into our paths in this way… I just knew he was Andrea’s boy! After the dust settled and medicals and reports had been reviewed we realized that Jesse’s SN was a heart defect (transposition of the great arteries among other defects), he was at an amazing facility (about the best one could ever dream of adopting from) and he was born in 2006. EARLY 2006. Needless to say, Andrea and Bob decided to forge ahead, regardless of finances. God wanted this child, to be named Cole, to come home to his family. Since then Andrea and Bob have worked tirelessly. She’s held 2 garage sales, put toys and clothing into 3 consignment sales, applied for grants and held a tennis tournament fundraiser. Bob is working 3 jobs and rarely, if ever, has a day off. And God has blessed their efforts. But now as travel approaches, they are far from having all the funds they need. Right now $6000 stands between them and their son and they have only two months to raise it. But I am confident that one way or another, God is going to provide! For a family that has lost a beloved son, it is just like the God we serve to replace her sadness with joy. There is no way to replace the precious son she lost, but He can bring joy out of sadness: not one but TWO cherished sons! As I shared in an earlier post, we have $344 left in our adoption account. And just a few days ago, I received a check from our last consignment sale for $561. I am going to combine those funds to put together a giveaway… all the proceeds will go straight to Andrea’s agency! Yeah… it’s giveaway time again 🙂 And this time it’s going to be bigger (hint: TWO prizes) and better (hint: really nice stuff)! Hurry up and give us the details, lady! I want to see Cole come home!!! Can’t wait to see how God raises up the funds….it’s gonna be good. Love to you and your sweet sis. Wow, what an amazing story! Looking forward to the give away! WOW!!! God is soooo GREAT!!! It is so obvious that Cole is meant to be your sister’s son!! What an amazing story. Andrea’s story brought tears to my eyes. I just love hearing how God works. He is into all the details. I can’t wait to read about the raffle! what an incredible story. I’ll be watching! What a wonderful story. Wow just amazing!!! I’m ready for the give away so bring it on!!!! Let’s go!!! WOW. I have been waiting for the day to see her story in print. You done good. What an amazing story. God is so in the details here. Let’s get that fundraiser started already, huh?? I am chompin a the bit to be a part of his story!! Let’s get that little man home. And, could he be any cuter???? Give Andrea a big ol hug from me! And thank her for sharing her story with us and for giving us a chance to be a part of it all. What an amazing story!! You are such a sweet sister & friend! I can't wait to see Cole home with his family!!! that story was so beautiful, I am sitting here weeping. Oh My Goodness! you know my story of losing my precious first born, Chelsea and how she led us to adopt Lindsey! I am blown away by your story and want to give to your sister.. PLEASE email me so I can send some funds!! I dont need the give away..I just want to help! Please forward my email to your sister!! God Bless her and all of the parents out there that say good bye to their children much to soon!! What a wonderful story about how God works things together for good for those who love Him! This is truly an AMAZING story! I can’t wait to see this little guy come HOME! Looking forward to help in any way I can! What an Awesome Testimony! Cole is a Doll! What a beautiful story! I know a couple from our town who works at New Day. If I ever had a chance to adopt one of those kids, I’d do it for sure! She can be assured that he is being well taken care of. I can’t wait to see the rest of the story! I feel very priveldged to have helped in a way to bring “Jesse” into your sisters arms. I can’t really described why i felt God wanted me to share his info with you that day but I can tell you in was a strong feelign and your the first person I thought of when seeing his file. Thanks for sharing…God is good! Can’t wait to hear the details, and I know the entire adoption/internet blogging community will pull through with GREAT amounts to bring that child home! What a precious story Stef. You can count me in girl! Hi Stef luv your site (and children) i did a 'chip in" for Baby Shepard&Baby Cole is your sister going to do another fund-raiser? i can probly help a little more i have an adress(i think) do they still live in Lilburn? or if she is going to do another fund-raiser i will seng$$ via internet I have Finilly learned how to do that!! Blessings Donnie in Ky. Thank you for sharing your sister and her family with us. I want to make a post about this giveaway on my blog, if you don’t mind. I cannot wait to see that sweet boy in his mama’s arms. What an awesome story…he is such a cutie! I become one huge goosebump when I hear about how God orchestrates such perfection! There’s no doubt that Cole is coming home to the family that God created especially for him. Praying for your sister’s adoption!!! Thank-you for sharing your sister’s story to her sons…I am in tears and can’t get rid of the lump in my throat, I am so touched. This is absolutely amazing….such faith and such happiness!!! What an amazing story – such detail and intricacies can only be overseen by a God who creates His loved ones with such finesse and precision! I cannot donate right now, as we are working off our adoption expenses and praying for our own funds to come in and ease the hardship. But you can bet I will be praying for Cole and your sister – what a blessed family you are. What an amazing God we serve. Wow, what an amazing story – I had tears in my eyes at all your sister and her husband have been through. Cole is precious, and they will all have been blessed to have found each other. I am so excited to see your sisters story. 🙂 I believe she brought D home just before we started “waiting” for Levi and I loved every morsel about him and about his family. I can not wait to see another sweet boy home with his family and am so happy for your sister. I’m Colleen’s sister, and I am very touched by Andrea’s story. I also believe in my heart that God will provide all that is needed. Andrea is so blessed to have you as her sister! I am so glad my own sister has you for a friend! This is a very heartwarming story and one I can relate to so well…thanks for sharing and can’t wait to participate.